"You maniac — it's rabies!" Sanders, Jim and Charles return to the halfway house, where they discover Fenton now in the full throws of rabid dementia. As Fenton lunges at Sanders, Charles throws the river water over him. After a struggle — Fenton is first wounded and then shot dead. Sanders' attention immediately turns to Charles, and an interrogation begins, as Sanders and Jim decide Charles' own fate. 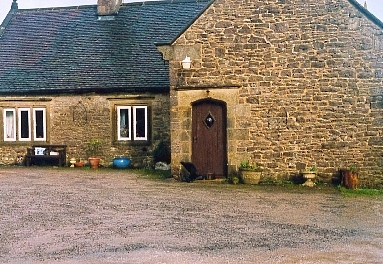 Description: The sequence takes place in the courtyard in front of Air Cottage — an isolated farm house (still a working farm, and now offering a bed and breakfast service) near the village of Ilam in Derbyshire. Where's the best vantage point? : This sequence is filmed by a number of cameras mounted around the courtyard in front of Air Cottage. Anything else? : The very limited parking at Air Cottage is private, and prior permission should be sought before making use of it. Alternatively, park in Ilam and approach the area on foot. The walk from the centre of Ilam is a fairly steep 30-40 minute climb - either by following the road uphill or (for those comfortable using OS maps) taking one of the footpaths up over the fields. 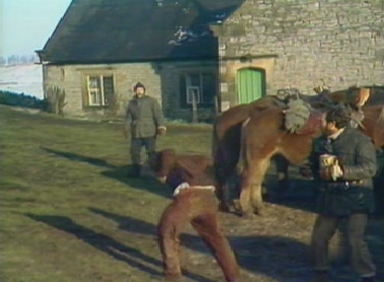 Several other sequences are filmed in the same area in front of Air Cottage — including Fenton's fevered wanderings; and Charles pulling the bound and unconscious Fenton back towards the house.